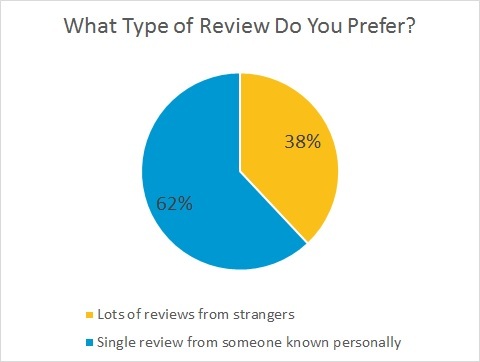 Recent poll shows consumers prefer a single review from someone they know personally over large numbers of reviews from strangers. In a February 2017 poll* conducted by Zappenin, the majority of consumers (62%) stated that when seeking a new product or service provider they value a single review from someone they know personally over lots of reviews from people they don’t know. When choosing a business (e.g., a restaurant, plumber, hair stylist), what type of review do you value most? The results were clear. The majority of consumers prefer even a single recommendation from someone they know personally over sifting through many reviews from strangers. In other words, social proof (or “social validation“) from peers, friends and relatives carries a lot of weight in choosing a business and making a buying decision. Clearly consumers value sites like Yelp & TripAdvisor… and even Google & Facebook… all known for amassing lots of reviews for millions of businesses & destinations. However, the reality is that many consumers would prefer just one “word-of-mouth” review from someone they know. The challenge is that word-of-mouth reviews are notoriously difficult to collect and make available exactly when consumers need them. Consumers must cobble together these highly-valued recommendations from friends & relatives on their own. Facebook and Google groups have made it easier in some situations, but it still far from mainstream behavior. Zappenin plans to change this. * Survey was conducted on both Facebook & Pollshare. 659 total respondents.